DO-94460-77 was succesfully added to your cart. 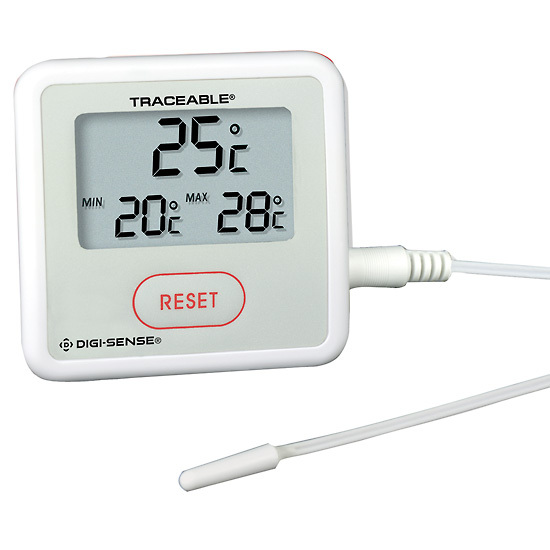 Thermometers include a weatherproof remote sensor with a 10-ft. (3.05m) long 1/16"-diameter micro cable. The micro cable is ideal for applications that require a seal, such as a refrigerator, where a larger cable would interfere with the sealing of the door. Unplugging the external probe will activate an internal sensor for monitoring ambient temperature. Thermometer features a high-impact ABS plastic case, large LCD that updates every 10 seconds, and a simple one-button reset to clear the high/low memory. Supplied with Velcro® strip for wall mounting or has a flip-out stand for tabletop use. NIST-traceable calibration report supplied by the manufacture, mounting hardware, and one battery. Can you purchase the wire probe for this thermometer separately? It is possible to order the probe separately. The correct part number depends on the serial number of your thermometer. Please contact us with that information, our contact information may be found at the top of the product's web page. The flashing is to notify you to change the batteries. This unit uses a 1.5V silver oxide button cell battery. This is very excellent piece of hand held device. Very convenienct and easy to use.